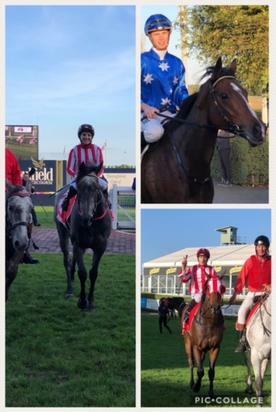 It has been a successful couple of weeks for the stable with 7 winners and 3 2nd placegetters from our last 14 runners! Flying Murty has gone to the paddock on the back of a successful first preparation with 4 starts for 3 wins and an unlucky 2nd. Our 2yo filly Honeysuckle Choice has also gone to the paddock after a successful start to her career winning in fine style at Moe and banking over 34K with the Vobis and Vobis Gold bonus - it certainly can pay well to invest in Vic bred horses! Looking forward to Spring with her. Nic Nac's mum is a mare called Galantine who is a full sister to Multi Group Winner Mic Mac - whilst Nic Nac has not reached quite the same heights as his uncle he is a handy Sprinter and it was very gratifying to see him back in the winners stall at Mornington this week after a near career ending catastrophic leg injury from a barrier incident at a Pakenham Night Meeting in April 2017. He has a great bunch of very patient owners, not to mention our Vet Ben Mason from Crown Equine who very painstakingly stitched him back together in the middle of the night. Tea for Choux also notched up win number 3 at start number 10 at Mornington. She is a super consistent mare and has never missed a cheque from all her starts. Looking forward to seeing her continue to step up to better things. Great to see our top mare Falika also back in the stables after a big break with a few little issues. Hoping she can be back racing in the Spring and pick up where she left off. Also back in work this week is the little star Lady Horseowner looking great after her break! Exciting times ahead for us with some more exciting youngsters making their debuts over the next few weeks and also the Yearlings are starting to arrive for some education. I must say after a slow start at the sales we have managed to snare a terrific bunch of yearlings including some real bargains, so please if you are thinking about buying into a horse feel free to get in touch as I am sure we will have a horse for you!